Overall, if you’re looking for a great story and don’t mind a little reading, I totally recommend checking out the Blu-ray release of The Salesman in stores now! It always amazes me as to what makes a picture popular. Is it the stars headlining the film? Is it the studio that releases the film? Is it all the advertising used to promote it? What if it all came down to the story that drove the film? If that were the case, The Salesman would be a box office success right up there alongside Logan and Beauty and the Beast. Instead, The Salesman sits at #54 on the box office for 2017….just below CHIPs, Smurfs: The Lost Village and The Great Wall. Makes a lot of sense doesn't it? But guess what? This little foreign film does have going for it… an Oscar for Best Foreign Film! It's sad, honestly, that it takes an Oscar to draw attention to a great little film like this one, but I'm sure everyone involved with the film will take it! 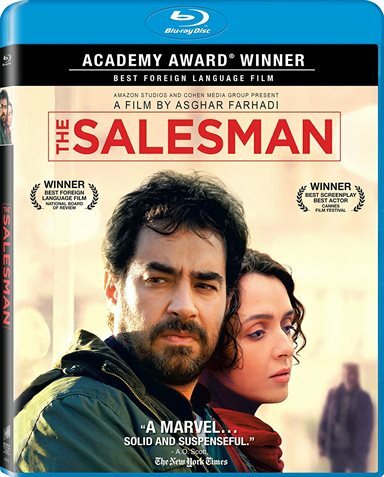 If like many out there, you haven't heard of The Salesman, it is a film out if Iran, directed by Asghar Farhadi and is spoken in Persian with English subtitles. Now, it's sad to say, many will hear the word "Subtitles" and run, but don't! This film is worth the extra work. I will admit that even I find subtitled films to be a bit of work myself, but, like I said, this film is worth it. The Salesman starts off with a married couple who, in the very opening scene, find themselves fleeing from their apartment building, along with the other residents, thinking it may collapse. This couple is now forced to find a new place to live. The husband, Emad (Shahab Hosseini), is a schoolteacher by day and by night an actor in a play, along with his wife Rana (Etesami). The couple, through a fellow actor, finds a new apartment to live in. The apartment comes with a chunk of baggage from the previous tenant who not only left furniture and belongings behind, she was also reportedly was a bit promiscuous. One night, while Emad is rehearsing for their production of Death of a Salesman, Rana is home alone and she gets a buzz from the front door. She buzzes the front lower level door open, thinking it was her husband Emad coming home from rehearsal, and leaves the door to the apartment ajar for him and then jumps in the shower. The only thing is, it wasn't Emad. Soon afterward, Emad comes home and can't get an answer from the apartment. He goes up the stairs and finds blood footprints coming from his apartment. Upon entering the apartment he finds his wife assaulted bleeding from the head. Who did it? Why? So many questions as to how something like this is handled in a world that isn't exactly like ours. There is so much of The Salesman that I really enjoyed. I always find it interesting to see how differently other cultures handle issues and even live day by day so differently than us. Just the fact that Emad teaches an all-boys class stood out to me. Beyond cultural differences, The Salesman very much plays off the Death of a Salesman production as well. The parallels are quite evident! The pacing of the story is quite brilliant. There are definite moments I thought it could go quite differently, and to my surprise, it didn't go as I had expected. Overall, if you're looking for a great story and don't mind a little reading, I totally recommend checking out the Blu-ray release of The Salesman in stores now! Along with the film, is a special bonus feature: A Conversation with Writer-Director Asghar Farhadi. I give "The Salesman" a B+! Download The Salesman from the iTunes Store in Digial HD. For more information about The Salesman visit the FlickDirect Movie Database. Sean's background in advertising, and love of the cinema brought Sean to reviewing films and interviewing the people behind the scenes involved in bringing this art form to life. His goal, to promote the best Hollywood has to offer! Read more reviews and content by Sean Ferguson.